A stay at Pod 51 places you in the heart of New York, within a 15-minute walk of 5th Avenue and St. Patrick's Cathedral. This hotel is 0.5 mi (0.9 km) from United Nations Headquarters and 0.6 mi (1 km) from Rockefeller Center. Make yourself at home in one of the 348 air-conditioned rooms featuring LCD televisions. Complimentary wired and wireless Internet access keeps you connected, and digital programming provides entertainment. Bathrooms have complimentary toiletries and hair dryers. Conveniences include phones, as well as safes and desks. 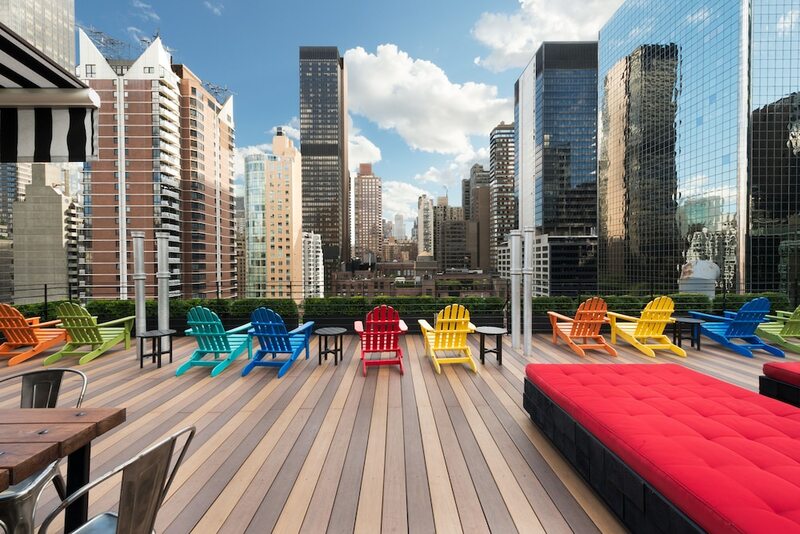 This affordably priced hotel is on East 51st Street, just four blocks east of Fifth Avenue and Rockefeller Center. The Theater District, Radio City Music Hall, and United Nations Headquarters are among the many attractions within six blocks. A seasonal outdoor café provides indoor and patio dining, and an independently operated and highly regarded French bistro is on the building's street level. Second and Third Avenues, brimming with restaurants and clubs, are within a five-minute walk. Subways, less than two blocks from The Pod Hotel New York, provide easy access to SoHo, the Meatpacking District, and other must-see neighborhoods. The hotel offers free guided walking tours of the city three days a week (weather permitting). Pod conveniences include complimentary WiFi and wired high-speed Internet access, a concierge desk, and self-parking (surcharge) one block away. Free newspapers are also available in the lobby. Le Bateau Ivre - Independently owned French bistro located on street level. More than 250 varieties of French wines by the glass. Raw and grilled seafood, meats, tartines (open-faced sandwiches). Open daily from 8 AM until 4 AM (hours subject to change). Saturday and Sunday brunch, with live jazz on Sunday. Outdoor Café - Open seasonally, this breakfast café offers indoor and patio dining. Central Park, 12 blocks (about a mile) from the hotel, encompasses 843 acres of meadows, woods, cliffs, ravines, gardens, paths, and lakes in an emerald setting. Popular walking and running routes include Central Park Drive (closed to traffic during scheduled hours) and the path around the Jacqueline Kennedy Onassis Reservoir. The park abounds with playgrounds and wide, open spaces for romping. The Loeb Boathouse, on a picturesque lake, has rowboat and bicycle rentals. The Wollman Rink offers ice-skating in the winter, the Victorian Gardens amusement park during warmer months, and splendid views of the park and city year-round.